Home for the Holidays Sale - Shop now and receive before Thanksgiving. Our Largest Sale of the Year!! 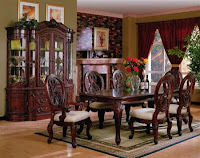 The Nottingham 7-Piece Dining Set by Coaster gives you what you need and more for a successful dining experience, consisting of a dining table, four side chairs, and two arm chairs.